Ang mga publikasyon at panunungkulan ni Nicanor G. Tiongson bilang pangkulturang administrador ay may landas na nabuksan tungo sa pananaw na makalipunan at maka-Pilipino. Tayong mga kababayan niya ay dapat lamang kumilala ng utang natin sa kanyang bisyon at sigasig bilang ulirang manggagawang pangkultura. 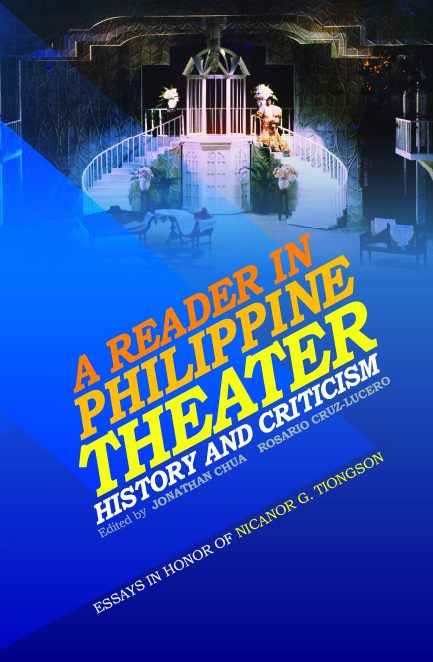 As cultural historian, theater artist, educator, and cultural leader, Nicanor G. Tiongson has been an inspiration for colleagues and a younger generation of scholars and cultural workers, as the present volume of diverse and excellent essays shows. In his capacious love for Philippine culture, and his passion to see it truly transformative in the life of the nation, Nic is an exemplary intellectual. Jonathan Chua is a faculty member of the Department of Interdisciplinary Studies, Ateneo de Manila University. He is the editor of The Critical Villa: Essays in Literary Criticism by Jose Garcia Villa (2002). Forthcoming is his edition of the collected short stories of Jose Garcia Villa. Rosario Cruz-Lucero teaches Philippine literature and creative writing at the University of the Philippines Diliman. Her critical essays are collected in her book, Ang Bayan sa Labas ng Maynila: The Nation beyond Manila (2007). Her latest publication is a book of historical fiction, La India, or Island of the Disappeared (2012).